We might be leaving tomorrow as the weather looks good. Today, Dennis worked on the generator with no luck. He had to order a pump and the man is going to Charlottetown today and will drop it off tonight. After several hours of working on it, he gave up and decided to became a spectator for another boat’s mast operation. Kim, the lady at the top of the mast, had to go and fix something. Yesterday, she was at the top for well over an hour but was unsuccessful. Dennis then gave it a try but he too was unsuccessful. So today, Kim tried again and I think she was able to fix whatever needed fixing. 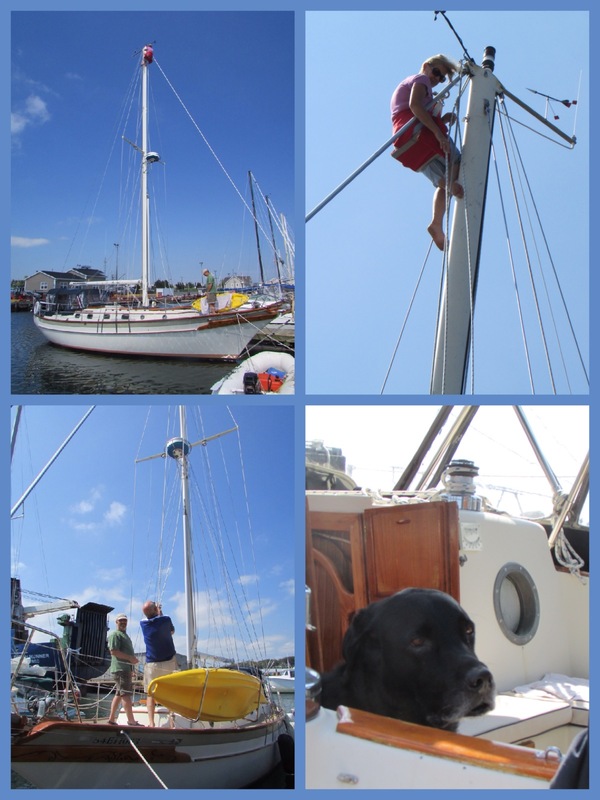 These pictures are of Kim at the top of the mast and Dennis and John at the bottom shouting their opinions about how the mast should be fixed. Hudson, the dog, was not amused. I forgot to mention that the other day, our friend Dale arrived. Dennis had met him in Quebec City last year. 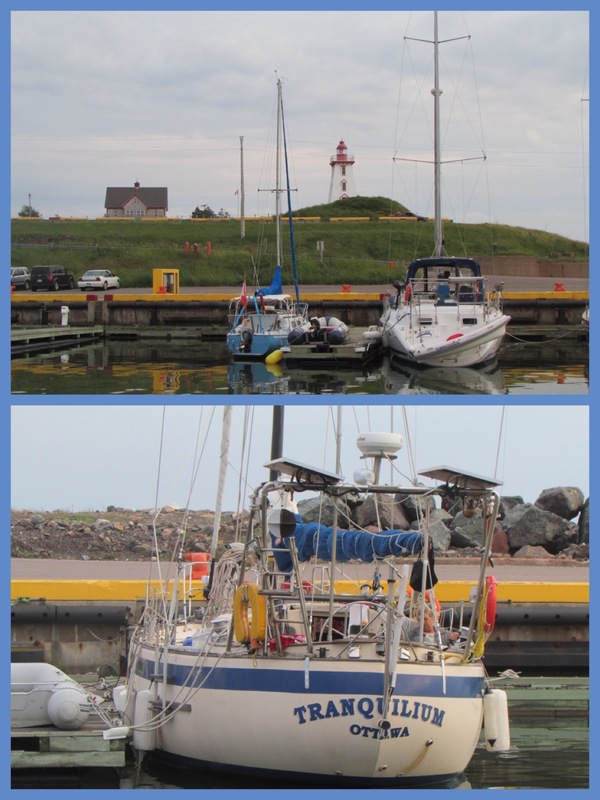 We met him again in Rimouski. Dale is on the Tranquillium and is travelling with his friends Dennis and Jean. I think he is staying here for the summer. That’s all the excitement for today! I think we’re going swimming now. This is Ernie and Denese. I had a good laugh just now when I was reading the caption that went along with the fotos of the guys watching Kim work. Equal opportunity applied correctly. I booked a quick flight back east for Aug. 11-15 to visit my family. All is well with them but Dad lost his drivers licence and the doctor suspects that he has dimentia. We were all aware that he wasn’t thinking straight but he would not go for testing so we did not really know what he was suffering from. He had his licence renewed last year but needed mom to help him to navigate any trips beyond New Subdury. Mom did not feel comfortable with Dad driving since he became beligerent whenever she tried to help him to navigate. Now, she does not have that to worry about. We will see how his condition progresses and perhaps he can get him the attention that he needs. I need this trip to take a break from the work load. This season has been unusually busy and I should have some reinforcements by that time. Our local airline “Air North” started service to Ottawa this spring. Twice a week, they fly to Ottawa with a stop in Yellowknife each way. That is conveniet to getting to Ontario quickly but then there is that longer drive to Sudbury. I got the Air North ticket at half price and got a sale deal with Porter Airlines to fly from Ottawa to Sudbury. I have also booked a flight to Costa Rica through Toronto in November. I will be stopping in Ontario for a bout a week before C.R. I will rent a car and drive up again. I will plan to stop in for a visit and will give you more info as to when as we get closer to that time. I hope that you have fair weather for sailing this summer. If you ever need another deck hand, please let me know. My rates are very afforable to you. Great photos but what finally cured the mast problem? Pump and Generator hassles! Worse than car repairs! Just had C Tire do the exhaust system [$400]. Do they have a C Tire for boats?